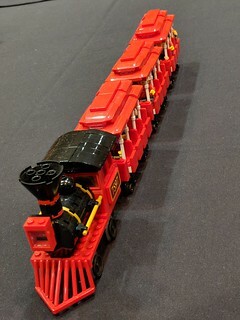 Originally it was going to be displayed at a train show that BayLUG was participating in, but I wasn’t able to attend that show. I sent it along with another club member who brought it to the show and displayed it there. 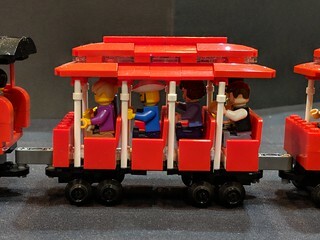 It has also appeared at Maker Faire Bay Area (San Mateo, CA) and Bricks by the Bay (Santa Clara, CA), which I attended. 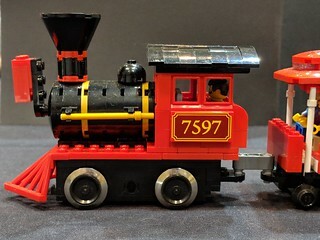 When I sent it along to that first train show, I didn’t include any minifigures though. The club member who filled it up with figures had a very difficult time as the roof is a bit too low. 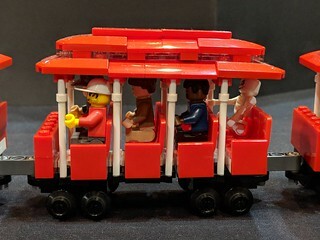 I managed to squeeze in the minifigures and finally saw the problem that they had at the earlier show. After Bricks by the Bay I made a small tweak to raise up the roof by two plates, and now the figs fit much better. These photos are from BBTB before that modification, however. 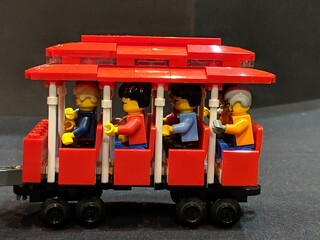 I’m considering making instructions to build this, so please let me know if you’d be interested. To see the full album of photos including its appearances at shows, click the album page (or view a slideshow).